Under contract to Durr-Megrant JV, JMS Naval Architects conducted an engineering review of the sea-fastening structural calculations use in the transport of a Heat Recovery Steam Generator (HRSG) module on board a 400 foot heavy lift barge from Coeymans, NY to Sewaren, NJ down the Hudson River. The 125-foot tall, 3,800 long ton Heat Recovery Steam Generator (HRSG) module will be part of the new Sewaren 7 power plant under construction in Woodbridge, NJ. 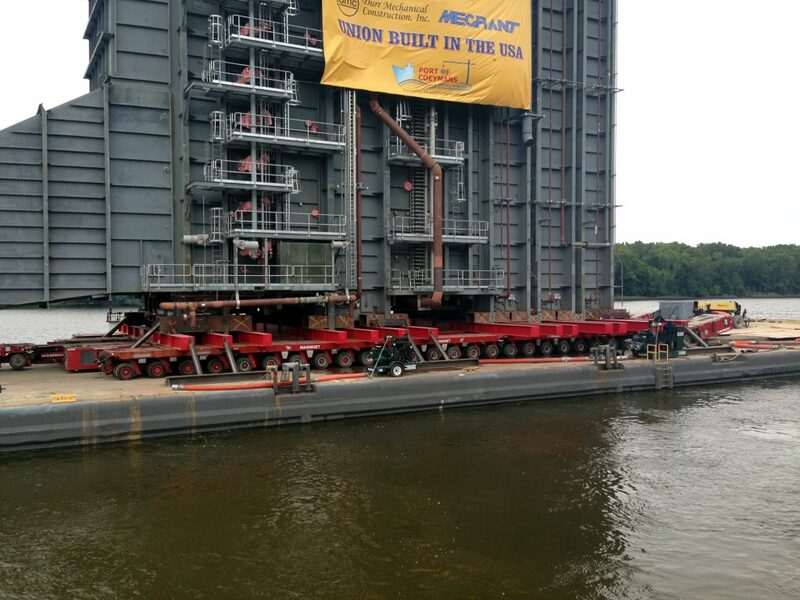 Mammoet Global Engineering performed the loadout operation of the machinery onto and off of the barge using their hydraulically-powered heavy-lift transporters. The Port of Coeymans/Carver Marine Towing performed the tow using their tug Mister Jim along with 2 assist tugs and McDonough Marine’s barge MARMAC 400. 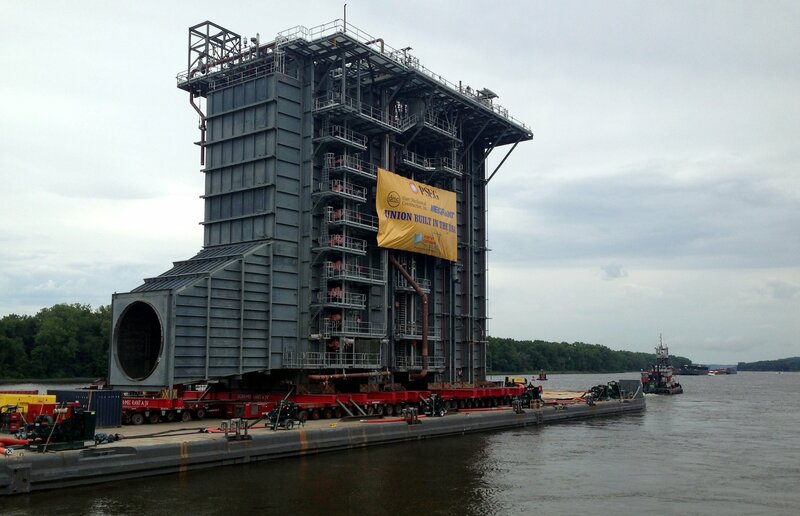 The HRSG module was successfully loaded onto the MARMAC 400 barge on 7 Aug and left Port of Coeymans for its 1 ½ day journey down the Hudson River and New York Harbor to Sewaren, NJ. The combined height of the barge and HRSG module above the water was 135 feet, requiring careful timing to clear the various bridges at the correct tide. 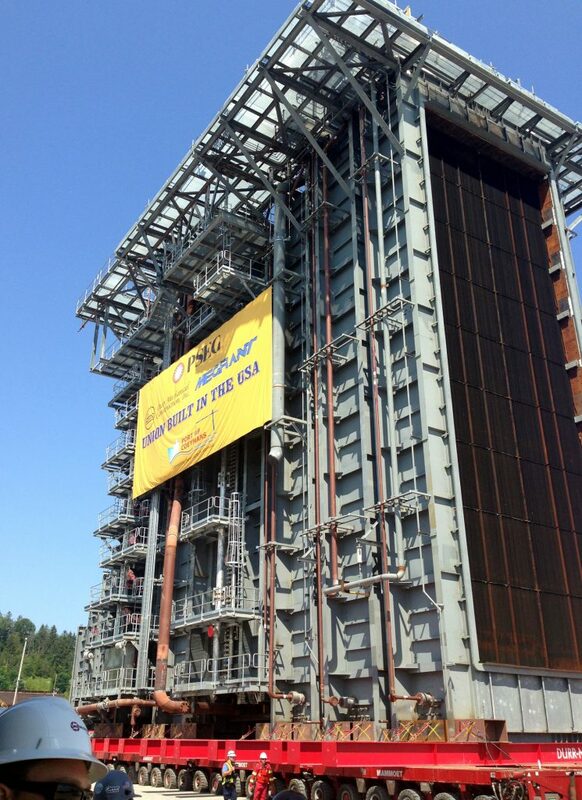 The HRSG module was tall enough that it had to be lit in accordance with FAA regulations. Transportation of the HRSG module from the Port of Coeymans marine terminal to Sewaren, NJ was the seventh of nine trips to carry various modules to the new power plant. In addition to performing an engineering review of the roll-on/roll-off calculations and sea fastenings JMS is conducting the pre-tow surveys of the barge and tugs for all nine of the load outs and tows. The Sewaren 7 power plant will be a highly-efficient, clean, dual-fuel, 540 megawatt (MW) combined-cycle power plant. Sewaren 7 represents an investment of more than $600 million and is targeted to be in operation in time for summer 2018. Sewaren 7 will bring 540 MWs of highly-efficient generating capacity to New Jersey and the region, supporting electric system reliability. The plant will run primarily on clean, efficient natural gas, but can also run on ultra-low-sulfur distillate fuel oil as a back-up fuel, ensuring exceptional dependability. The power plant will be constructed at PSEG Power’s existing Sewaren Generating Station in Woodbridge, New Jersey, replacing 4 Sewaren generating units, which will be retired after almost 70 years of operation providing energy to New Jersey. By repowering an existing generating site, PSEG is able to take advantage of existing infrastructure, replacing older, less efficient generating units with cleaner, more efficient technology.